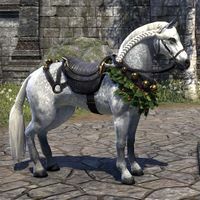 Created after years of extensive breeding, the White-Gold Imperial Courser is said to be the most beautiful horse in all of Tamriel. With its almost ethereal beauty, these horses are owned by only the wealthiest riders. 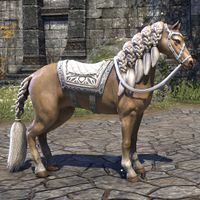 The White-Gold Imperial Courser is a horse mount available for a limited time from the Crown Store for 035003,500 . It emits golden sparkles. Its default name is "Majesty". A rare, highly-sought cross between a midnight steed and a Skyrim ice-horse. 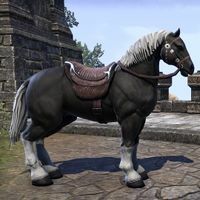 The White Mane Horse is a black and white horse mount available from the Crown Store for 00900900 . It is also available as part of the Starter Pack, Adept for 010001,000 Its default name is "Snowmane". The Wild Hunt Bear is a forest beast that has lost its Y'ffre-given ability to choose between being plant or animal, reverting to the primal chaos of the Dawn Era. 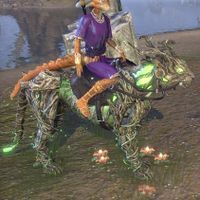 The Wild Hunt Bear Mount is available as an Apex-level reward in the Wild Hunt Crown Crate. Its default name is "Branch-Britches". It leaves behind green pawprints, and small flowers briefly bloom where it stands still. When the Wood Elves invoke the Wild Hunt, creatures forget their Y'ffre-taught shapes and shift into unnatural forms. Such are the Wild Hunt Horses, mounts that occupy a space between flora and fauna. 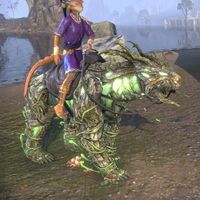 The Wild Hunt Horse is a green Wild Hunt-themed horse mount made out of roots and held together by nature magic. 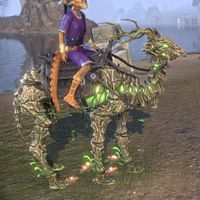 It is available from the Crown Store via Wild Hunt Crown Crates and is considered to be an 'Apex' level reward. It leaves behind green hoofprints, and small flowers briefly bloom where it stands still. Its default name is "Greenmare". Some say that Hircine meddled with the nature of wolves in a way that made them susceptible to shape-shifting, and from this Daedric interference came both the Werewolf - and the Wild Hunt Wolf. What is the truth of this? Y'ffre knows! 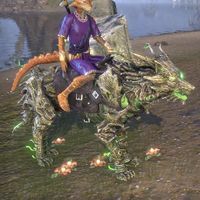 The Wild Hunt Wolf Mount is available as an Apex-level reward in the Wild Hunt Crown Crate. Its default name is "Lobo Leaf". It leaves behind green pawprints, and small flowers briefly bloom where it stands still. This festive horse is sure to spread holiday cheer—with bells on! The proud owner of such a steed can be almost assured that they have the handsomest horse in town. The Winter Garland Dapple Gray was available from the Crown Store from December 7, 2017 through January 2, 2018 (roughly coinciding with the New Life Festival of 2017) for 025002,500 . Its default name is "Dapper". During their invasion of High Rock, the Reachmen were profoundly impressed by the power and splendor of the Breton mounted knights, and decided to breed their own hardy northern steeds to the same size. They succeeded! 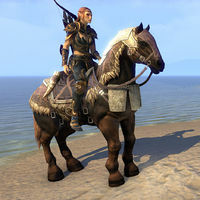 The Witch Knight Charger is an armored brown horse mount temporarily available from the Crown Store for 025002,500 . Its default name is "Knightmare". 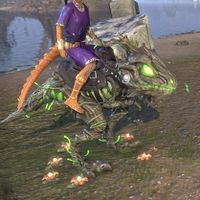 Wolf-Lizard Steed is available in Xanmeer Crown Crates as an Apex-level reward. Its default name is "Scaly-Wolf". This page was last modified on 3 April 2019, at 19:20.